The promo-material proudly tells about how they always wear white and of course an alarm bell should start ringing when a rock band is praised for their looks more than their music. But it is with good reason because the music seems toothless and uninspired to me when it is best and a track like “Reaky Deaky Boys and Girls” are simply close to be the worst track I have heard for years! 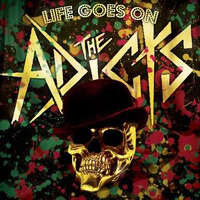 Maybe some connoisseurs of new wave or pop-punk music will like this; maybe The Adicts are a good band life. I don’t know. It always pains be give an album a bad grade because I basically respect artists and the work they do, but this album, albeit not unbearable, does nothing for me.